The 4th of July Committee is holding a dance for the 7th and 8th graders at the Williams Middle School this Friday, May 2nd from 6:30 to 8:30 p.m. The committee is still looking for some chaperones for the dance. Chaperones would be needed from around 6:15-8:45/9:00 and if you are able to volunteer please email Ashley Maloney at ampoohbear@comcast.net. The Spring Plant Sale will be held by the Bridgewater Garden Club on Saturday, May 10, from 9 A.M. to noon, inside the Senior Center, Wally Krueger Way, off of Routes 28 and 18 in Bridgewater. Perennial plants from members gardens, annuals, herbs and hanging plants will be available. Benefits go to the scholarship fund for two $1500 scholarships. For additional information call 508-697-7617. Bridgewater-Raynham Regional School District Technology Department is sponsoring Recycling Days. This is your opportunity to help the environment and help them purchase new technology for the school district. Dispose of your old appliances and electronics on Saturday, May 3rd at the Williams Middle School parking lot from 9 a.m. to noon. For additional information go to the school district's website. The votes are in and Bridgewater residents hope to see the Sutherland Pipe Band in this years Fourth of July Parade in Bridgewater! There will be the monthly book sale this Saturday, May 3rd, from 10 AM to noon in the Flora T. Little Meeting Room at the Bridgewater Public Library. Gently used books will be for sale or please feel free to simply swing by and make a donation! This event is sponsored by the Friends of the Bridgewater Public Library. The Mirrin Trio, a trio comprised of BSC music faculty members, will perform on Tuesday, April 29 at 7:30 p.m. in Boyden Hall's Horace Mann Auditorium on the campus of Bridgewater State College. The trio includes Annegret Klaua, violinist, Adele Carter, cellist and Deborah Nemko, pianist. They will perform works by Brahms, Bolcom and Mozart. The concert is free and open to the public. For more information, call 508.531.1377. Although there is still technically time to vote, the poll will close at 8PM tonight when the actual election polls close. For the race of Library Board of Trustees, Carlton Hunt and Ellen Chiocca-Carey are in the lead on Around the Common. We shall see if the election results hold true! Please do not forget to get out and vote on Saturday, April 26! Polls are open at Bridgewater-Raynham High School from 7am to 8pm. With an increase in demand volunteers are needed more than ever. Please take the time to help out those in need. Bridgewater Elder Affairs is in the process of dividing meals on wheels delivery routes in an effort to simplify delivery for volunteer drivers. If interested in volunteering to be a meals on wheels driver please contact Gloria at 508-697-0929. The Creative Writers Group welcomes any new writers that are interested in learning more about the group. The only thing one needs is a fondness for writing and a hope to have a good time! The first poll question is Who Do You Support for Library Board of Trustees. You can vote for up to two candidates. The next poll question has to deal with the 4th of July Parade and asks which band you would like to see in the parade. Due to possible funding shortfalls, the parade might not be able to sponsor all the bands it has in the past. Please vote for one of the following and click the links below to see more about each band. The poll results for Who Do You Support for B-R School Committee are in! Congratulations to both candidates and good luck in the general election! Ever wonder why at 4 o'clock you're suffering from low energy and brain fog? Why you're irritable at some points of the day and crave sugar at others? Come and learn about the food/mood connection and gain more energy and control over your life. Fee: $25 for one person or $40 for two. Can also register for two of Noelle's workshops for $40 (see events calendar for upcoming Noelle events). Registration: Required. Please call 508-697-2334 to join! The 10th Annual St. Thomas Aquinas Golf Charity Tournament will be held May 9, 2008 at Olde Scotland Links in Bridgewater. Through the generosity of golfers over the past 10 years, over $120,000 has been raised. These funds have been donated to St. Thomas Aquinas, Knights of Columbus, St. Vincent DePaul, CYO and Life Teen Program. All proceeds from this years tournament will go toward St. Thomas Aquinas Parish. Businesses and individuals interested in partaking or sponsoring a hole are all welcome. There will be a post-tournament reception Under the Tent following the golfing. A hole sponsorship is $125.00 and a foursome costs $540.00. Please make your check out to St. Thomas Charity Golf. Any additional assistance you might be willing to provide such as an auction or raffle item would also be greatly appreciated. For more information, please call Thomas P. Arrighi at 508.697.1526. Checks can be mailed to Tom at 20 Ledgewood Drive, Bridgewater, MA 02324. This message is not to be construed as an endorsement or lack thereof for any candidate by Around the Common. The numbers in Mr. Oliari’s 3 year plan sound like incredibly good news – total budget increases of $1M per year, with no need for cuts, layoffs or an override to make it all work. The catch is that it starts one year in the future, and he does not address how we get from where we are today to his FY'10 number. It sounds too good to be true and unfortunately it is, but he’s hoping the voters won’t figure that out until after the election. *The FY'09 $39.9 million projected annual spending limit is based on $800K of one-time speculative revenue in addition to other questionable revenue sources for which continues to increase the bottom line only to lessen the perception of cuts. On average has increased 7 to 12 % per year in recent years – using the conservative # of 7% - that would project a $1.1M increase for FY10. 2. SPED transportation = $1.766M (from FY09 school line item budget) – has been increasing at a double digit rate in recent years, but let’s assume a conservative 6% increase for FY10 – that would be $106k by itself. Just considering the costs above, we could conservatively project $1.7 to $1.8M in additional costs between FY09 & FY10. How does Mr. Oliari plan to make up the difference between $1.7M & $100K WITHOUT cuts or layoffs – let’s see if he will answer that question between now and election day! On February 14, 1942 the crew of the light cruiser USS Juneau stood tall and proud as their ship was commissioned in a ceremony held at the New York Navy Yard. Members of the commissioning crew included the five Sullivan brothers of Waterloo, Iowa: Albert, Francis, George, Joseph and Madison. The brothers, whose motto was “We Stick Together,” stipulated as a condition of their enlistment that they be allowed to serve aboard the same ship. Despite accepted Navy policy, which discouraged but did not forbid family members from serving together, their request was approved. After Juneau’s Atlantic christening, the cruiser was assigned to the South Pacific. On 13 November 1942, the Juneau participated in an intense naval battle near Guadalcanal. One torpedo launched from Japanese submarine I-26 scored a direct hit on Juneau’s magazine. The resulting explosion cut the cruiser in half. Juneau sank within minutes, taking many of the trapped crew to watery deaths. Survivor accounts indicated four of the Sullivan brother died in the initial explosion, while the fifth, George, survived the attack but died in the water five days later. Two Bridgewater sailors, brothers John Manley Pierpont, age 23, and Robert Atwill Pierpont, age 24, were killed aboard a warship, name unknown, in the Pacific Theater of Operations, on 12 July 1945. They resided at 1163 Summer Street and were the sons of Myron Atwill and Helen Pierpont. I have no other information. I would appreciate any information that you might have so that their sacrifice can be properly noted and preserved for future generations. $157.05 Raised for Bridgewater Public Library! Thanks to everyone that has purchased the BWTR stickers, a check today was presented to the Bridgewater Public Library in the amount of $157.05. Stickers continue to be on sale and we are currently working on our next group for donations to be submitted to. If you have any recommendations, please let me know by emailing Around the Common by clicking here. What questions would you ask the candidates? Are you interested in knowing where the candidates for Library Board of Trustees, B-R School Committee and/or Selectmen stand on an issue? The Bridgewater Democratic Town Committee is hosting a candidate's night tomorrow, Wednesday April 16th, at BTV Studios on Spring Street at 7PM. This candidate's night will be televised and is open to the public. If you have a question you would like to be considered as one to ask the candidates, please email the committee by clicking here. The poll results are in and Bridgewater residents support changing the structure of town government. With the Town Government Study Committee considering possible changes in the way in which government operates in Bridgewater, it will be interesting to see these suggestions considered in principle. While keeping open town meeting did fare well, the overall winner was changing to a strong town manager form of government. Every year Bridgewater Little League asks for donations of 12 packs of canned soda from each family on Opening Day. This year we would like to try to get as many donations delivered be before Opening Day as possible to lighten the load for the volunteers in the snack bar that morning and let them concentrate on setting up for a very long and busy day. All of the coaches have been instructed to accept your donations some time during this coming week during practices. The Bridgewater Recreation Commission is looking for energetic and outgoing people for our summer recreation programs. Applicants must be creative and enjoy children; actively participate on field or in pool (Swim Program); keep attendance records and financial accounting; plan daily activities in advance; plan field trips, guest speakers. Applicants must have excellent communication skills; handle constant contact with the general public; promote program in a positive manner; be self-motivated and able to anticipate changing weather or schedules; have strong organizational skills; be reliable and dependable. Must have current First Aid and CPR certifications. Click here for an application. Applications should be returned to Bridgewater Recreation, Town Hall - 64 Central Square, Bridgewater, MA 02324. Applications must be received by April 25, 2008. It was voted that the town form a Town Government Study Committee. The Committee will look at the general overall makeup of town government and make various recommendations to the town for any changes to the current form of town government or for an alternative form of town government. When appointments to the Committee were completed in February, the Committee met and organized as follows: Ed Ivaldi as Chairperson; Sheila Whitaker as Vice-Chairperson, and Ernie Talpey as Secretary. The Members that complete the Committee appointments are Dr. Jabbar Al-Obaidi, Chris Delmonte, Jim Moore, and Anna Nalevanko. Working to finalize the scope, detail, and time-frames of the study, the Committee has met on the 11th and 18th of March 2008 and the 1st of April and plans to hold its meetings on the 1st and 3rd Tuesday’s of each month through the remainder of the year in the Police Department’s Community Room at 7:30pm. Plans are being made for due-diligence research and community input in order to reach workable recommendations. The committee will present a preliminary report at the May Town Meeting. Next meeting is April 15th. To email The Committee, please click here. The Passport to the Arts is a celebration of the creative work of students from grades K-12, with 2 days of art, music, and interactive fun taking place at BRRHS. This event will take place on Friday, April 11 from 3-8 PM and on Saturday, April 12 from 10 AM - 2 PM. All events will be at Bridgewater-Raynham Regional High School at 415 Center Street in Bridgewater. The Bridgewater Democratic Town Committee will be holding their monthly meeting tonight at 7pm at the Polish Club. There will be a guest speaker from the group Early Education For All. The grass is getting greener. Spring is here! Time to refresh and rejuvenate! Feel energized with a lifestyle plan to get you motivated and to feel great for life! Come and learn how to eat cleaner, healthier, and smarter for better health and wellness. 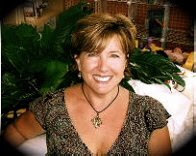 Noelle Armstrong is a Certified Holistic Health Coach who helps to clear up the confusion around healthy eating, and helps clients to find their balance with health, happiness and overall well being. She offers individual, group and family nutritional programs, healthy fun cooking classes, pantry organization, menu planning and workshops. She has a B.S. in Education, and is a graduate of the Institute of Integrative Nutrition, and is currently involved in the graduate mentoring program at IIN. Fee: $25 for one or $40 for two. You can also register for two of Noelle's workshops (see events calendar for upcoming Noelle events) for $40. Bridgewater Residents Agree: We Love the new Home Depot! The poll results from last week are in and Bridgewater residents agree that they love the new Home Depot. A fundraiser for a charity event that is being held in honor of Bridgewater resident, Shirley Wilbur's, deceased daughter's memory will be held this Saturday, April 12th, at 7:30 PM at the Jockey Club in Raynham. Her daughter Sherrie died of cancer and her granddaughter, Cindy, is organizing a fundraiser to honor Sherrie's memory. The charity, "The Tomorrow Fund" is the only local nonprofit organization that provides emotional and financial support to children with cancer and their families. The ticket price of $35 includes dinner, DJ, dancing and raffles. Tickets can be purchased from Shirley or tickets can be obtained by calling Cindy at 617-335-3189 or at 508-386-0451 or by e-mail at Cindylee96@aol.com Donations are tax-deductible. 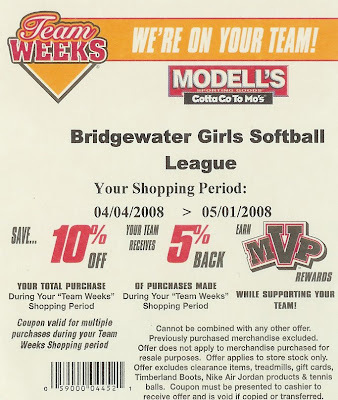 Bridgewater Girls Softball League is happy to announce that Modell's in Brockton has teamed up with us to offer a special incentive for BGSL members. From 4/4 until 5/1 any purchases you make in the Brockton store are eligible for a 10% discount by using the BGSL pass below. Additionally, if collectively more than $1,500 in total purchases are made in April, BGSL will get an additional 5% of the total sent in a check directly to the league. Be sure to take advantage of this win-win situation if you have any equipment/attire needs by printing out the coupon at the top of this post and bringing it to Modell's. 1st session: Friday April 11th from 7:00PM to 9:30PM at the BR High School lecture hall located on the second floor next to the library. 2nd session: Sunday April 13th from 9:00AM to 1:00PM at the Vets Club Function Hall. The clinic will be in the hall from 9 to 12 and then will go across to the fields for the last hour. If you have any questions contact Alex MacKinnon at 508-728-6383. The Literacy Place in Bridgewater, a non profit program that tutors adults in reading and ESL, is in need of audio cassette tape players to play recorded books and lessons on. Since most people have made the move to CDa there must be some machines gathering dust in basements and attics. Any style is great with traditional styles, Walk Man or boom boxes all accepted. Headphones, any style, will also be accepted. You can contact MauraAnnette410@gmail.com or call (508)697-9099 to donate or to get information on the program. America's Little Angels Preschool announces their monthly service projects. Please consider supporting them generously. 1. They are collecting personal items like shampoo, conditioner, deodorant, toothpaste, tooth brushes, etc to donate to HUGS II. 2. They are collecting diapers, wipes, gently used children's clothing for Keeping Pace with Multiple Miracles. 3. Collection of gently used children's toys and books for a yard sale that is being done to support the Jimmy Fund. 4. And finally hand lotions, soaps, body gel, and stuff like that for baskets we will be making for Mother's Day baskets for an area homeless shelter. Pick up can be arranged by emailing America's Little Angels Preschool by clicking here. The Central Square Church will hold its annual spring rummage and bake sale from 9 a.m. to 1 p.m. Saturday at the church. Featured will be clothing, household items, jewelry, books, toys, a free fashion show and more. Friday, April 4th from 7-9pm. Last year's Spring Renewal Challenge was a huge success. Many of you have asked about it, and we are happy to announce that our 2nd Annual Spring Renewal Challenge will begin at our Kick-off Meeting held on Friday, April 4th form 7-9pm. Accept our challenge for us all to be in better health at the end of May than we are at the beginning of April! Points earned by completing all or any of our challenges will be put towards a discount at Uplifting Connections, which can be used at our Night of Celebration! This night is a party, just for you, our Renewal Challenge participants who have earned points! Come celebrate who you are and all that you've done for yourself during our Renewal Challenge. Our Night of Celebration will be held on Tuesday, June 3rd from 7-9pm. Door prizes for all and rewards for the highest point-earners! Do you need to attend the Kick-off meeting to participate in our challenge? No, but it will help motivate you and educate you on what you can do for yourself. You'll also be introduced to some fabulous people who can help you on your way, and, it's free! Bridgewater faces a defining moment on April 26, when we go to the polls and elect a new member to the Board of Selectmen who will be making decisions about the issues facing our community. Bridgewater is in need of leadership that will offer clear and consistent positions. This past week we witnessed Selectman Oliari unveil a budget plan that simply doesn't add up. His new focus to hold spending in line within Proposition 2 1/2 has no credibility based on his past actions. He is trying to have it both ways by now criticizing unchecked spending on the very contracts he had supported two years ago. Given this, why would anyone now trust Selectman Oliari to offer anything more than three more years of reckless fiscal policies? My other challenger in this race, Marilee Hunt, simply takes positions, for, and against, everything. Last year, she aggressively supported an excessive override. Now, as a candidate, she would have us believe she's against one, despite the fact our town is facing deeper financial problems and our town services are being impacted at a greater level. In addition, last year she advocated for additional cuts to our Police and Fire Departments in order to lessen impacts to other departments after the September override failed. Now, she describes herself as not soft on public safety. And finally, just last week, Candidate Hunt referenced Selectman Oliari's budget plan as, "as good a job as you can do on a balanced budget" (Brockton Enterprise, "Budget Solution Draws Mixed Reaction", March 23,2008) only to state his plan was "absolutely ridiculous" three days later in the Bridgewater Independent ("Getting Back Into The Black", March 26,2008). It is time that Bridgewater elects someone who understands the value of, and can be trusted with, our hard earned tax dollars. I not only bring a comprehensive understanding of municipal finance and budget trends to the table, but also, a proven track record of providing consistent, clear-cut positions, no matter how unpopular. I will not play election year politics at the expense of the town. My opponents, in the last week alone, have proven they will. emphasizes safety while teaching good archery form and technique. The clinic will run for two hours each day in the lower field at Scotland Field. Class will be canceled in case of inclement weather, and will be rescheduled. The cost is $95.00 per participant and includes the use of all needed equipment. Due to safety concerns, class size is limited to 20 participants. An Advancement Award is presented on the last day that demonstrates the student’s progress through the 10 levels of achievement. Join the fun! Learn a new sport or come and practice your skills! Don’t miss out! For more information or to sign up, please contact the Recreation Department at 508.697.8020. Express your personal style through Earth's Elements quality sterling silver jewelry at an exceptional value and feel great when those compliments start coming in! Host an Open House and share good times with your friends and family through a casual and fun, no pressure gathering and earn generous hospitality benefits as a "Thank You". If you host a party, you are guaranteed to NEVER PAY FULL PRICE. You will earn free and discounted jewelry and will get your order shipped to you for free! 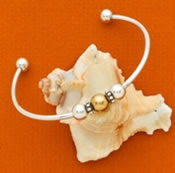 Bridgewater is lucky enough to have an Earth's Elements Jewelry consultant right here in town! To plan your Open House or for more information, please call Kati Moreau at 508.697.9963 or email her by clicking here.